In addition to the University Student Conduct Policies (found here), Housing & Residence Life has residential policies that all students and guests are expected to abide by. These policies apply to university apartments and residence halls. Click HERE for a printable version. Please review the Guide To Campus Living for additional information. Public areas of residence halls/apartments, including lounges, community bathrooms, hallways, etc. are not intended for storage of personal belongings. If students leave their personal belongings in these areas the items will be considered abandoned property and may be removed or disposed of by staff. Items left in residence halls/apartments after the owner has moved out/vacated the hall/apartment, or relocated to another room, and items not marked as to ownership will be declared abandoned. When possible, a written notification will be sent via UNA email to a resident whose items have been left behind. If no action is taken by the resident to remove the items from the hall/apartment within the timeline indicated in the notification sent to the student, Housing & Residence Life will dispose of the items. The University of North Alabama and Housing & Residence Life are not responsible for any items left in the halls/apartments. Housing & Residence Life must approve all flyers, posters, and other advertising. Advertising is restricted to events, programs, and information directly related to or sponsored by an official university organization, department, etc. Items promoting the consumption of alcohol will not be posted. Please provide enough copies for each residence hall and/or apartment. Currently, we would need approximately 75 copies for each floor OR 9 copies for each hall and 5-10 copies for apartments. Please submit your materials approximately seven (7) working days prior to the event to allow sufficient time to get your material approved, distributed, and posted. Once approved, Housing & Residence Life staff will post signage. Items not approved will be removed from the halls/apartments. Alcohol: Alabama State Law prohibits the possession or consumption of alcohol by anyone under the age of 21. UNA and Housing & Residence Life expect students and their guests to comply fully with these laws. A resident who is 21 or older may possess alcohol and drink responsibly in his/her room/apartment as long as their roommate is also 21 or older. If one roommate is under 21, no alcohol is allowed in the room/apartment. A resident who is 21 or older may drink in the room/apartment of another 21-year-old resident if that resident is present. All guests must abide by the residential alcohol policy. Anyone under 21 that is present in a room/apartment where a policy violation has occurred will be considered in violation of the alcohol policy. Alcohol is not allowed at any time in any public area of a residence hall/apartment. A public area may be a hallway, lounge, lobby, walkway, stairwell, or any other area not contained in a specific room/apartment. Any alcohol being transported by someone 21 or older must be completely covered from open view and taken directly to the resident’s room/apartment. Empty bottles, cans, bongs, funnels, mass drinking items, and other alcohol “decorations” are not allowed in any room/apartment that has a resident under 21. Anyone present in a room/apartment where a controlled substances policy violation has occurred will be considered in violation of the controlled substances policy. any otherwise lawfully available product or substance (such as over the counter or prescription drugs, glue, paint, etc.) used for any purpose other than its intended use. Because the University takes the safety of everyone in university housing very seriously, we cannot allow students to bring certain items into their room/apartment. Prohibited items may differ depending on location. During health and safety inspections, university officials will require the removal of prohibited appliances or materials from residence hall rooms including, but not limited to; portable space heaters, halogen lamps, oil-based or wax electric air fresheners, candles, sunlamps, bicycles, combustible liquids, incense and incense burners, power tools, grills, and camping stoves, and all cooking appliances with the exception of microwave ovens (700 watts), refrigerators (up to 4.3 cubic feet) and Keurig style coffee makers. Violations will result in confiscation of the appliance(s) and residents may be subject to the student conduct process. Candles, incense, potpourri, scented burners, plug-ins, and any other item that generates heat and/or open flame are prohibited in the residence halls/apartments. Melted wax, burned wicks, lingering aroma, etc., may be considered evidence of a violation of this policy. Cohabitation is not permitted in residence halls/apartments. Cohabitation exists when a person who is not assigned to a particular room/apartment uses that room/apartment as if he/she were living there. Examples of this may include, but are not limited to, accessing the room/apartment while the assigned occupants are not present, utilizing a key to enter a room/apartment to which one is not assigned, keeping clothing and other items in the room, sleeping overnight in the room/apartment on a regular basis, and using the bathroom and shower facilities as if they lived in that room. Residents are permitted to have a guest or guests spend the night for a maximum of three nights in any 30-day period. Cohabitation is defined as visitors residing with a resident, in a residence hall/apartment for more than a total of three (3) nights in a 30-day period. All overnight visitations must be consistent with any applicable roommate agreements. Any resident found having an individual living with them is subject to the student conduct process and/or immediate termination of their residence hall/apartment contract. When a guest’s continual presence hinders a roommate’s ability to study, sleep, and/or occupy their room, this will be considered a violation of this policy. Individual or group activities that may result in disturbance or distress to others or that cause, or may reasonably be expected to cause, damage or destruction to self or property are prohibited. When individual responsibility cannot be determined, the residents of a floor/building/apartment may become collectively responsible for restoration costs. Examples of behavior covered by this policy include, but are not limited to, noise, damage to a building, laundry equipment, or furniture; sports in the hallway; smoking; graffiti; publicly spoken or displayed materials that are pornographic, obscene, sexist, racist, or homophobic; vandalism; and disregard for bathroom cleanliness, including the disposal of food or any foreign objects in sinks, toilets, water fountains, etc. Each resident is responsible for the ongoing condition of their room/apartment and shall reimburse the University for any damages or loss of items. Charges for damages will be determined by the University at its discretion and must be paid before the end of the semester in which the damages occur. Please see the Room Condition Report section for additional information on reporting damages upon arrival. 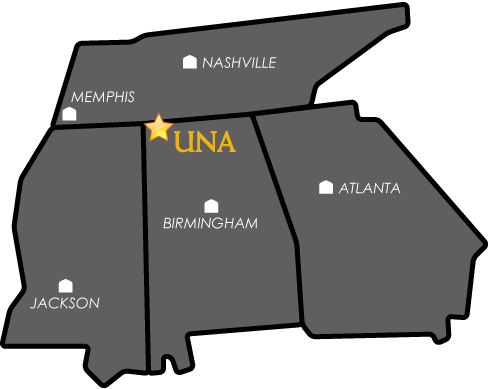 We encourage students to make your room/apartment feel like your UNA home. However, there are decorative guidelines that must be followed in order to preserve the quality of rooms/apartment. Decorations e.g. pictures, posters, etc. may be attached using blue painter tape. Double-sided tape, 3M Command Strips, nails, and non-removable decals should not be applied to any surface. Do not attach items to the ceiling and refrain from using combustible materials e.g. cotton, paper, straw, etc. for safety reasons. Decorations are prohibited from obstructing sprinkler heads, smoke detectors, exits and signage, emergency lighting, or corridors. Fire safety equipment is provided to help ensure everyone’s safety. Tampering with alarms, extinguishers, or smoke detectors is a violation of local, state, and federal laws, as well as a violation of university policy. Tampering with fire safety equipment is a criminal offense and a ticket/fine may be issued. Pets are not permitted in the residence halls/apartments, with the exception of fish. Fish tanks may be no larger than five gallons total capacity per room. Common area spaces are reserved for the exclusive use of the staff and residents of that building. Any mode of decoration that contains obscene, profane, pornographic, or otherwise offensive elements as determined by professional staff will not be permitted. Possession of stolen property, including city, county, or state government property, such as road signs, is not permitted and a violation of state law and university policy. Students wishing to display public road signs, traffic cones, real-estate signs, etc., in their rooms may be asked to provide proof of ownership by a receipt or other official means. Stolen or unauthorized property is subject to confiscation. Residents have the right to sleep and study in their rooms/apartments at any time. When asked by someone to respect this right, residents are expected to demonstrate courtesy and consideration by complying with the request. As a general rule, at no time should noise be heard from a resident’s room/apartment more than two doors away or from another floor. Courtesy hours are in effect 24 hours a day, seven days a week. Quiet hours are effective in each residence hall/apartment between 10pm-10am daily. Quiet hours are in effect 24 hours a day during the fall and spring finals period. University of North Alabama prohibits smoking on all university-owned and operated property both indoors and outdoors. "Smoking," as used in this policy, refers to inhaling, exhaling, burning, or carrying any lighted or heated smoking product and to the use of any such other electronic or other device that is used as an alternative to traditional tobacco products and that produces a smoke or vapor when in use. "Smoking products" include, but are not limited to, all cigarette products (cigarettes, bidis, kreteks, e-cigarettes, etc.) and all smoke-producing products (cigars, pipes, hookahs, vaporizers, etc.). “University-owned and operated property” includes, but is not limited to: all outdoor common and educational areas; all university buildings; university-owned/operated housing facilities; campus sidewalks; recreational areas; outdoor stadiums; and university-owned and leased vehicles (regardless of location). Littering campus with the remains of smoking products is also prohibited. This policy applies to all employees, students, visitors, contractors, and externally affiliated individuals or companies renting university-owned space on university-owned and operated property campus grounds. Door-to-door sales or solicitation in the residence halls/apartments is not permitted. Sales are defined as any effort to offer a product or service in return for money, goods, or other services. Solicitation is defined as any effort to ask for donations or contributions of money, goods, or series. If anyone is found selling or soliciting in the residence halls/apartments, they will be escorted off the property and may be subject to the conduct process. University housing is to be used solely for residential purposes. Residents are not permitted to operate businesses out of their rooms/apartments or to publicly list room numbers in commercial ads or other business announcements. Students are responsible for disposing of their own trash in appropriate exterior trash receptacles or interior trash chutes. Students found to have disposed of any waste inappropriately may be processed through student conduct. Closing or covering vents is prohibited in all residence halls/apartments. It is also prohibited to enter or exit a residence hall/apartment through a window or pass any item in or out of the window. A guest is someone who visits a residence hall/apartment at the invitation of the resident inviting him/her as a guest. Guests are permitted in a room/apartment if all occupants consent and they are to be escorted at all times. Guests may be accommodated in university housing for no more than three nights in any 30-day period per resident. Guests under the age of 18 are not allowed visitation without permission from the designated Area Coordinator at least 24 hours in advance. Residents are responsible for the actions of their guests and ensuring that they abide by all applicable policies and regulations. Housing & Residence Life reserves the right to distinguish visitors from residents and revoke privileges in the event of inappropriate activities/behaviors at any point during the visit. A “weapon” can be defined as any object or substance designed to inflict a wound, cause injury or incapacitate, or create a reasonable fear of harm, including but not limited to, all firearms, including air rifles and pellet guns; bow and arrows; ammunition; knives (other than kitchen knives); martial arts weapons; brass knuckles; explosives; and dangerous chemicals or poisons that are possessed with the intent to injure another or to cause damage to property. All types of guns (including paintball guns, airsoft guns, pellet guns, etc. ), bows and arrows, tasers, and all other weapons are prohibited in residence halls. Any device that has the appearance and/or function of a serviceable weapon or is being used in a manner of a real weapon is also prohibited in residence halls. Additionally, residential students and guests are expected to abide by the University Weapons Policy at all times. In addition to the policies listed above, residents are expected to be aware of the following guidelines and expectations. Housing & Residence Life also reserves the right to confiscate, discard, hold, or surrender to appropriate authorities any item in any room/apartment that violates university policies and regulations as stated in this handbook, the website, the university catalog, or any other official university publication. Pay the additional fee necessary to occupy the room/apartment for the remainder of the semester as a private. Private rooms will be approved on a first-come, first-served basis and are contingent upon space and availability. Seek out another roommate and request a room/apartment change with someone that currently has no roommate. Allow the Occupancy/Apartment Coordinator to assign a new resident to the room/apartment or move to another room/apartment that has only one occupant. University apartments and residence halls are considered private residence. As such, entrance to a facility is restricted to residents and their invited guests. A valid Mane Card programmed for entry to that building provides proof of residence in any residence hall. Apartment occupancy may be verified using a valid Mane Card and departmental roster authentication. A room key alone is not considered proof of residence. Students who fail to provide appropriate identification upon entering the apartments/residence halls will be asked to leave and may be subject to follow-up through student conduct. Charges are subject to change as necessary. If there is smoke in the room, keep low to the floor. Before passing through any door, feel the doorknob. If it is hot, do not open the door. Before opening a door, brace yourself against the door and open it slightly. If heat and smoke are present, close the door and stay in the room. If you cannot leave the room, open the window. If trapped, attract the fire department by hanging an object out the window. If you can leave the room, close the door behind you. Go to the nearest exit or stairwell. Do not use the elevator. If the nearest exit is blocked by fire, heat or smoke, go to an alternate exit. If all exits are blocked, go back to your room, open the windows, and attract the fire department. After evacuating the building, move to the designated meeting location (at least 50 feet from the building). Emergency personnel and equipment will be maneuvering around the building. Follow the directions of fire, police, and Housing & Residence Life staff. You may reenter the building only after fire and police officials have given their approval. Your guests are welcome in the residence halls/apartments provided they adhere to University policy during their visit. You are responsible for the conduct of your guests during their time on campus. Please refer to the Visitation Policy for all expectations related to visitation and guests. The University of North Alabama is committed to a policy of nondiscrimination and assignments will be made without regard to race, color, pregnancy, religion, creed, ethnicity, sexual orientation, national origin, disability, age, veterans or military status, predisposing genetic characteristics or any other protected category under applicable local, state, or federal law. Residents are only allowed to occupy a room/apartment if they have an official assignment for that room/apartment. Residents found to be in violation of this policy may be subject to immediate termination of the residence hall/apartment contract and forfeit his/her right to remain in the residence halls/apartments. Residence hall rooms/apartments may not be sublet to another person. Additionally, residents should only occupy their assigned space. If a resident is found to be occupying both sides of the room in a residence hall or entire apartment then they will be charged the full double as a single fee. Residential students should purchase residential parking decals. Any questions regarding proper decal can be answered by UNA Transportation. Residents are not allowed to utilize 'authorized staff only' parking spots at Olive, Rivers, and Rice Hall as indicated by signage. Any vehicles occupying 'authorized staff only' spots will be ticketed or towed at the owner's expense. Bathroom facilities in each traditional residence hall are designated by gender. Residents and guests may only use facilities designated for their gender. Guests needing to travel between floors in order to use such facilities must be escorted by their host to the bathroom door. Public restrooms for guests are also available in the lobby of all buildings. Once an assignment has been made, any request for change must be submitted in writing to Housing & Residence Life using an official Room Change Request Form. An open room change process is held approximately two weeks after classes begin each semester. Requests are granted based on priority and available spaces. All changes must be approved and coordinated by Housing & Residence Life. Any student who makes an unauthorized move will be charged $150 for conducting an improper room change. If deemed necessary and advisable for the safety, security, and maintenance of an educational atmosphere, a room may be searched. Searches will be conducted only in accordance with the preceding statement or if there is reasonable cause to believe that a student(s) is using his/her room for a purpose in violation of federal, state or local laws, or University regulations. Any room search, except one conducted by law enforcement officers with a duly issued search warrant, must be approved by Senior Administration and/or Housing Professional Staff.